Uses 7g single 44mm ESE pods. Serve the very finest coffee, including espresso and cappuccino, in the smallest of premises, with perfect results without breaking the bank. 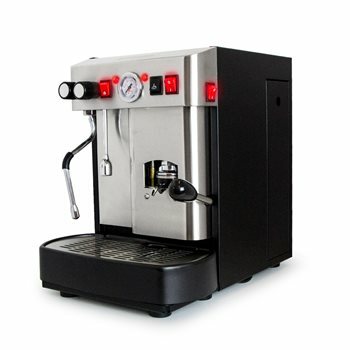 The Cecilia 1 group is a professional coffee pod machine which lets you prepare espresso and froth milk simultaneously. The Cecilia 1 group exists in two versions: manual and automatic. The automatic version gives you the possibility of setting the delivery time: long (for a long coffee) or short (for a short, concentrated coffee). Like all the models in the series, it is fitted with a 3.5 litre boiler giving plenty of hot water and steam and a separate thermoblock for the group, which gives the perfect temperature through the coffee and considerable savings in energy consumption.